Product #3810 | SKU AJA00047 | 0.0 (no ratings yet) Thanks for your rating! 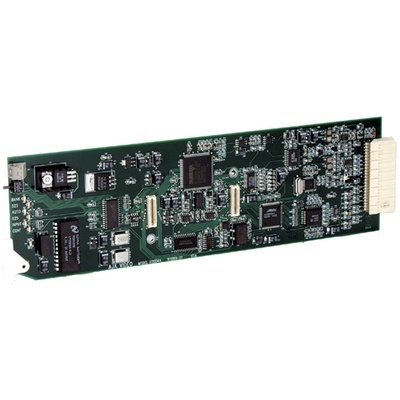 The R20AD provides excellent quality, 10-bit conversion of component or composite analog video video to SDI. The R20AD accepts YPbPr (SMTE, EBU-N10), Betacam, or RGB component inputs and NTSC/PAL or YC (S-Video) composite inputs. The R20AD features a 3 Line Adaptive Comb Filter for high quality decoding of composite sources. The comb filter can be switched to 2 line or notch modes for minimum delay requirements. The R20AD also accomodates the optional FSG card (Frame Sync) offering choices for synchronizing the output video relative to an external reference or the input video. NTSC/PAL configuration is automatic. Video format, AGC, H/V blanking, and pedestal are all user configurable.